Beyond adding visual interest to objects, colors affect physiology, emotions, and mental states. In fact, certain hues have a healing influence. Here are five colors to enhance your senior loved one’s home and life. This color can ease your loved one’s mind and nerves. Since purple fosters restfulness, paint bedroom walls in lavender, or make up the bed with lavender linens and a comforter. Decorate a bathroom with lilac shower curtains, towels, and bar soap. Violet, associated with luxury, adds opulence to a living room couch. For a senior who enjoys making handcrafts, use amethyst to encourage creativity. In a room designed for study, iris prompts contemplation. If your loved one has dementia, decorate with periwinkle chairs, lending serenity. Reddish shades like mulberry and plum are old-fashioned, linked to family traditions. Feature them in the dining room on a table runner, place mats, or silk flower arrangement. In addition to bright colors, dedicated caregivers can play an integral role in boosting a senior’s mood and overall wellbeing. Maintaining a high quality of life can be challenging for some seniors, but professional caregivers can help them obtain this goal. Families can trust in Pawleys Island, South Carolina, home care experts to help their elderly loved ones focus on lifestyle choices that increase the chances of living a longer and healthier life. This color, embodying sunshine, is cheerful and uplifting. In an entryway, butter yellow is welcoming. It also expands small spaces like hallways. For a senior who tends to be downcast, pineapple yellow develops optimism. A lemon-yellow kitchen creates a happy atmosphere for preparing meals and eating. This color also aids in digestion. For tasks requiring concentration, daffodil yellow promotes clear thinking and good judgment. Place accessories in this shade on a desk or in a home office. Even sunny yellow Post-it notes can be energizing. In the dining room, hints of gold create elegance. Place gold candlesticks on the table, or adorn drapes with gilt tiebacks and tassels. Hang paintings and photos showcased in gilded frames. In a living room, goldenrod carpeting radiates warmth. Excessive yellow can spur anxiety. Therefore, this color is best used in small amounts or as an accent. Green lowers blood pressure, stabilizes metabolism, and composes the nervous system. It gives the eyes a place to rest, alleviating stress. This color is especially therapeutic for a senior with Alzheimer’s disease. You can add green to any room with houseplants. Easy, low-maintenance types are Chinese evergreen, pothos, spider plant, peperomia, and African violet. In an entryway, an Irish green rug creates a bright greeting. Nestled on a couch, fern green cushions help seniors unwind. Rejuvenating forest green spruces up a bathroom. In the bedroom, linens in mint or seafoam can ease a senior to sleep. Teal encourages communication, alleviating loneliness. To spur conversation at the kitchen table, set it with teal mugs, bowls, and plates. This hue also aids concentration and decision-making. The color associated with love conveys kindness. 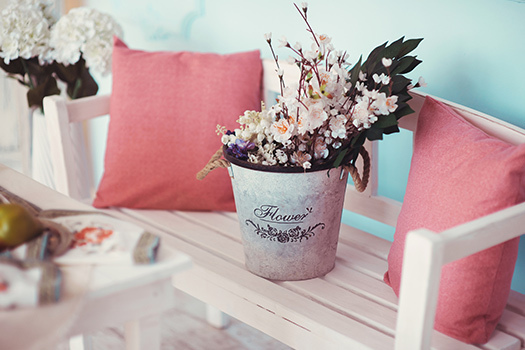 Pale pink can soothe agitation in a senior with Alzheimer’s disease. Connoting femininity, carnation brings a sweet ambiance to a woman’s bedroom. Use a darker shade like fuchsia to brighten a room with low light. In a living room, a salmon pink couch creates a focal point. For a senior with poor vision, pink carpeting aids navigation. In the bathroom, cameo pink tiles look retro, inviting a reluctant senior to bathe. Make the tub more appealing with a satin pink bath mat, towels, and soap. A caregiver wearing light rose can also have a calming effect. Professionally trained caregivers can help seniors feel relaxed and comfortable at home and offer respite to family members. If you are the primary caregiver for a senior loved one in Pawleys Island, respite care is available when you need time away from your important caregiving duties. At Home Care Assistance, our respite caregivers are available 24 hours a day, 7 days a week to help your loved one manage everyday tasks in the comfort of home while you have the chance to take a much-needed break. The color of the sky frees the mind, alleviating tension. Physiologically, it lowers heart rate, blood pressure, temperature, and inflammation. Light shades of blue make a room seem cooler. In the bedroom, baby blue linens and curtains aid falling asleep. In a home office, cornflower blue increases productivity. Increase relaxation in the bathroom with powder blue shower curtains and porcelain fixtures. For a stately look in a living room, appoint furniture in French blue with matching drapes. Make a small room appear larger with sky blue carpeting. Instantly embellish home décor with flower arrangements. Buy bouquets in purple, yellow, green, pink, and blue. Carnations, mums, and gerbera daisies are long-lasting. It’s preferable to decorate with bright colors, rather than muted ones. In the course of aging, the eye lens thickens, hardens, and yellows. This deterioration causes colors to look less vibrant to seniors than young people. Elders with dementia may have difficulty making sense of their surroundings. Having reduced contrast perception, it’s more challenging for them to see the edges of objects. To promote safer navigation, use cool colors against warmer hues, making borders more visible. Consider hiring a caregiver if you need a break from your caregiving duties to tend to other important tasks, such as decorating your elderly loved one’s room. If your senior loved one needs hourly or live-in care, Pawleys Island Home Care Assistance can help. Our caregivers can assist with exercise and mobility, prepare nutritious meals, provide timely medication reminders, and help with a wide array of other important daily tasks. To learn about our premier elderly care plans, get in touch with our staff at (843) 353-3105 today.